bl.uk > Online Gallery Home	> Online exhibitions	> Asia, Pacific and Africa Collections	> Beejapore. 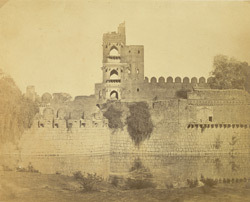 A photograph of a view of the city of Bijapur showing the fortifications from the 'Vibart Collection of Views in South India' taken by Henry Hinten about 1860. 'It was only after Yusuf Adil Khan declared himself independent that Bijapur assumed any importance. The rings of fortifications begun by Yusuf and completed by Ali I in about 1565 define two concentric zones, with the citadel in the middle, some 400 mts in circumference, contained within the city. The greater east-west axis of this configuration stretches to over 3 kms. This preference for circular layouts was maintained in later times when Ibrahim II gave orders for the twin city of Nauraspur to be laid out at a site 3 kms. to the west. The ramparts, begun in 1599 but never completed, define a ring of even greater dimensions than those of Bijapur. Fortifications at both cities display sloping walls reaching to a height of about 10 mts, with round bastions, numbering 96 in the outer ring at Bijapur, topped with crenellations and interspersed with machicolations. Gates with lofty arched entrances are set between massive bastions and approached across bridges spanning ditches, now mostly filled in. The building in the background, the Sat Manzili or Seven Storeys Palace (1583) was probably intended as a pleasure house.